"It takes two people to paint a picture," goes the old saying. "One to paint it, the other to make him stop." Which is pretty sage, and if someone I respect urges me to stick a fork in it, I generally do. But at his recent workshop in Cincinnati, Tom Dunlay offered a far more useful dictum for determining when a picture is done. But before we look at that, let's look at the stuff I've done over the past five days. A little sketch like this is fairly easy to pronounce completed, because it is based on a very simple notion: a spotlit figure's white shirt placed over the shadows of the trestle, while his dark legs are placed over the brightly lit dirt road. Once this was accomplished, there wasn't much more it seemed to need. The painting was based on this pen and pencil sketch. If a scene appeals to you, you can try drawing it, and then play with different ways of cropping it. I decided not to show the sky over the trestle, but instead to show only the trestle, the road, and some foliage. Doing the drawing gave me the idea of adding the figure. Again, it was fairly easy to call the picture completed, and move on. 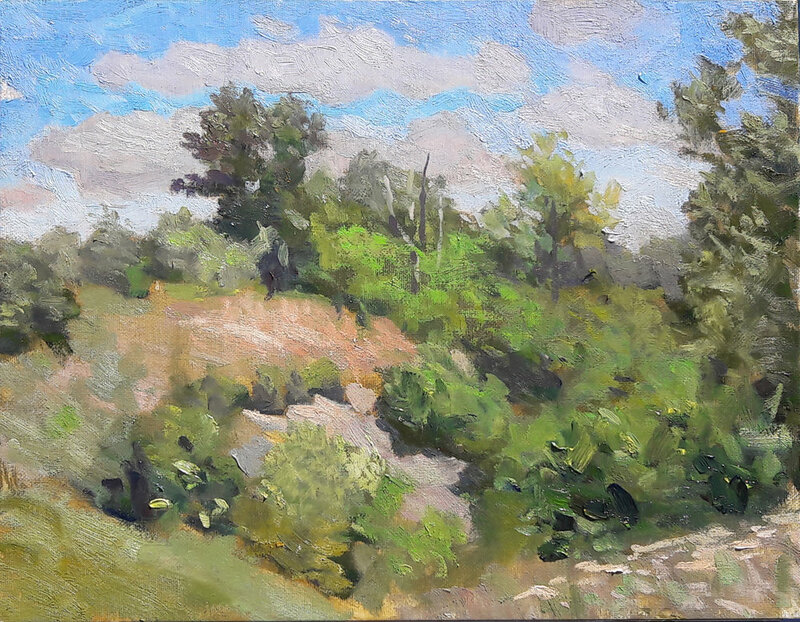 The next day I found a hillside along Roundbottom Road and, instead of doing a pen sketch, I decided to go directly to canvas, roughing in the picture as a series of lights and darks. I used yellow ochre with some ultramarine. Ochre is nice for this because it doesn't much stain a canvas. This means that you can rough in your big shapes and, if you change your mind about anything, it'll easily wipe clean with a rag and turpentine. This is how the scene actually looked. There is a big tree on the right, off camera, which I brought into the scene, to improve the shape of the sky mass. Still on Day One, I began painting in the sky, and then divided the landscape into middle tones and darks. This is still doing the work I used the drawing for in the previous picture, feeling out what sort of an image seems pleasing to me. So this was the end of Day One. It took about an hour and a half. Or maybe longer, if you count the many hours you spend driving around looking for vistas which seem worth building a picture around. The next day gave me another couple of hours to futz with the image. One thing that the previous day's rub-in had was a sense of unity, but that sort of unity tends to get lost when you come back and actually try painting color into the scene. One way to regain a little bit of that unity is to scrape down the picture. This may sound weird if you've never done it, but it can be very helpful. I let the picture sit on the dashboard of my truck for a couple of hours, which hastened the drying process, and then carefully scraped off all thickness of paint, using a palette knife. This is done for a couple of reasons. One is that the procedure produces an extremely pleasant surface to work on the next day. Another is that it mutes the values and colors a bit, pulling both toward the middle. And lastly, once scraped in this fashion, the picture will be bone dry the next day. The "next day" was today. I went back and put in another couple of hours. After that, I realized that the image was nowhere near what I saw before me, and verisimilitude seemed to slip farther away from me the more I tried to chase it. Which brings us back to Tom Dunlay's dictum. "When the improvements the picture needs are beyond your technical ability to make them," Dunlay said, "then the picture is done." This thing needs a lot of improvements. The color's wrong. 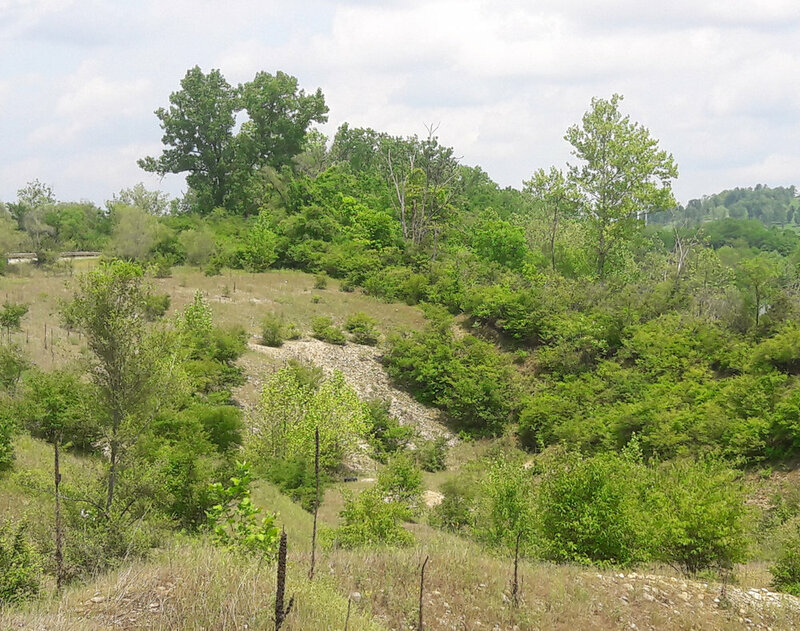 The topography of the hill is unclear. The values are jumpy. But hell, it's only an 11x14". Maybe later this spring I'll know what I should have done differently. In the meantime, with Dunlay like Jimmy Cricket on my shoulder, I'm calling this one done.